The shoulder is a true engineering masterpiece, which allows significant range of movement along with the possibility of high speed, which is very demanding to accomplish if we think of the stability required to combine these two factors. Thus, the shoulder movement is the result of a combination of 4 (some people defend 5) joints coordinated movements. The main joint, the one we call the shoulder joint is between humerus (upper arm bone) and the scapula (shoulder blade), but the scapula itself glides on the thorax and it can be the source of some of your shoulder pain. Shoulder impingement (medically known as sub acromial impingment) is a conflict of space that occurs under the acromion which is the hook of the scapula forming the ceiling of the shoulder, just above the top of the humerus. Between these two structures there are 2 structures: part of the rotator cuff tendons (supraspinatus mainly) and the sub acromial bursa, a sack of fluid that is meant to reduce the friction between the supraspinatus and the acromion. If you follow this reasoning, these structures can be in a conflict of space if the acromion and humerus are closer together or if the bursa or supraspinatus get swollen, requiring more space to be comfortable. As raised above, one of the reasons that may lead to this problem is a poor posture of the scapula that is tilted forward leading to a depression of the acromion, pinching and impinging the structures when the arm moves, especially upwards, to reach up. 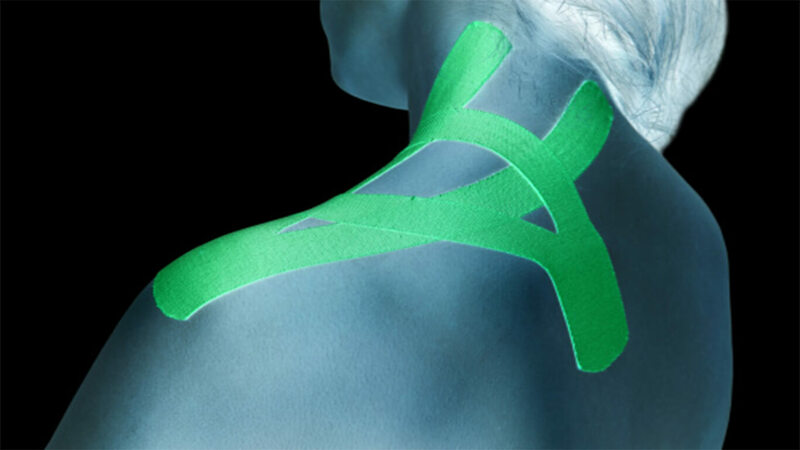 Five research articles over the last 7-10 years show that ktape or kinesiology tape, a hypoallergenic tape with elastic properties may be used to improve and correct the position of the shoulder blade, offloading the impinged structures. It is suggested that, instead of a physical correction with the ktape, the effects are due to an input provided by the sensation of having tape stuck to the skin that will change the muscle control and consequently the shoulder blade position, towards the correct position, facilitating the normal movement and reducing pain. Kim BJ, Lee JH., Effects of scapula-upward taping using kinesiology tape in a patient with shoulder pain caused by scapular downward rotation, J Phys Ther Sci. 2015 Feb;27(2):547-8.